Today's prisoners are Pedro de la Caridad Alvarez Pedroso and Daniel Santovenia Fernandez. Whether an inmate in the Castro gulag is a "political prisoner" is not determined solely by the nature of their supposed "crime," but also in how the regime proceeds with its prosecution. That means, for example, someone convicted of "terrorism" or "acts against the security of the state" — like the two men profiled here this week — might be considered political prisoners if the regime ignores its own laws in order to make a political example of the accused. According to Inter-American Commission on Human Rights, that's exactly what happened to Daniel Santovenia Fernandez and Pedro de la Caridad Alvarez Pedroso, as well as a third man, Eduardo Díaz Betancourt, they were with when they were caught trying to sneak onto the island in December 1991. All three had been Cuban exiles living in Miami. All three were convicted and sentenced to death. On appeal, the death sentences for Santovenia and Alvarez were commuted to 30 years. But on Jan. 20, 1992, Díaz, the suspected ringleader of the group, was executed by firing squad. Human rights organizations have said repeatedly that the three convicted men had not committeed any act of violence, that the trial was a summary proceeding and that under Article 124, paragraph B of the Cuban Penal Code, the penalty for entering the country clandestinely for the purpose of perpetrating a crime against the security of the State is 10 to 20 years' imprisonment, not the death penalty. A matter of particular concern was the statement made by the Council of State to the effect that "revolutionary justice will be less and less lenient" toward those who try to undermine the system. The Inter American Commission on Human Rights considers that the trial was a summary proceeding which does not guarantee due process. Moreover, the Commission must point out that the penalty is excessive and disproportionate since the individuals in question had not committed any acts of violence. 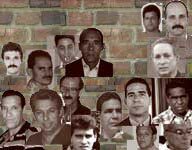 The independent Cuban Commission on Human Rights and National Reconciliation lists Santovenia and Fernandez as political prisoners. During a speech in Miami this past weekend, Elizardo Sanchez, the director of the human rights commission, addressed whether men like Alvarez and Santovenia, convicted of violence-related charges, should be considered "political" prisoners. "In the end, they are still political prisoners, armed opposition activists. That’s how Fidel Castro took power, and in Cuba, using arms to topple governments is almost a tradition,” Sanchez said.